We docked in Maputo early in the morning on March 31. Maputo is the capital and biggest city in Mozambique, with a population in excess of 1 million. Until after independence was achieved in 1975 Maputo was called Lourenço Marques, after the first Portuguese visitor to this spot in 1544. Mozambique is still struggling to rebuild its economy and infrastructure after a lengthy civil war that ended in 1992. We were signed up with our travel agency for a 4 day/3 night safari in South Africa’s Kruger National Park so we had no opportunity to explore Maputo. Our group met in the Ocean Bar for an expected early departure, but we didn’t leave until the local officials cleared the ship after 8:00. We would be driving to the safari camp in what turned out to be an incredibly cramped little bus. It had no room for luggage above or below the seats, which were themselves way too narrow. So we had to keep our carry on luggage (a backpack with our electronics, primarily) on our laps the whole way. This crowding, along with very small windows, made photographing from the moving bus difficult. That’s why some of these pictures aren’t very sharp. We drove through Maputo, past the iconic 100 year old railway station and through some rather run down neighborhoods. We don’t know whether there are better areas of Maputo than we passed through but what we saw looked pretty basic. Outside Maputo we continued driving toward the border. We passed markets, a mosque & many local folks. We had to leave the bus twice at the South African border. First we had to pass through Mozambique customs, then board the bus again for about 100 yards, then go through South African customs. Near the customs buildings were some interesting flora and some buildings. South African customs went very slowly at first because they were photographing each entrant & scanning their fingerprints, but the machines were not working properly. This was frustrating because there was another line on the other side of the desk that was moving briskly with no photographs or fingerprints. Finally, they dispensed with the photos & fingerprints on our side as well and we moved through customs much more quickly. After clearing customs we drove to a parking lot where we were given box lunches. We drove on a highway, which had an interesting sign at the entry gate. We listened carefully, but never heard the “boom.” We crossed the Crocodile River & entered Kruger National Park by the Crocodile Bridge Gate. Then we drove to the main lodge of our safari camp. Our lodge, Camp Shawu, is one of three that are run by a single company in an area a little north of the Crocodile Bridge Gate. Our bus took us first to the main lodge, called Shishangeni, where many of the group would be staying. It is in a wooded area & monkeys felt free to enter the lodge, although the kitchen & dining room workers used squirt guns to chase them away. It was very nice, but beyond the monkeys there was little in the way of wildlife. After the long ride on the cramped bus, it felt good to get out & stretch our legs here. Originally, Robert, Mary & Rick were to be the only Amsterdam passengers at Camp Shawu. The reservations for this safari, less than half the cost of HAL’s similar Kruger safari, filled up well before the deadline so we were too late to book it. Then they obtained additional rooms at the other two camps run by this company. Most of the overflow passengers ended up at Camp Shonga but we didn’t make that cut either. We thought we had been shut out, but then our travel agent obtained two rooms at Camp Shawu & we grabbed them. This turned out to be a great development for us because Camp Shawu was (at least in our opinion) the best of the three lodges. Apparently some other folks backed out of reservations at Camp Shawu because while we were at the lodge our group leader, Tom, announced that two more couples were to be assigned there. The two couples, Terry & Marsha and Rob & Marlene, completed what turned out to be a very compatible group. Occupying 4 of the 5 huts at Camp Shawu, the seven of us turned out to be the only guests there. 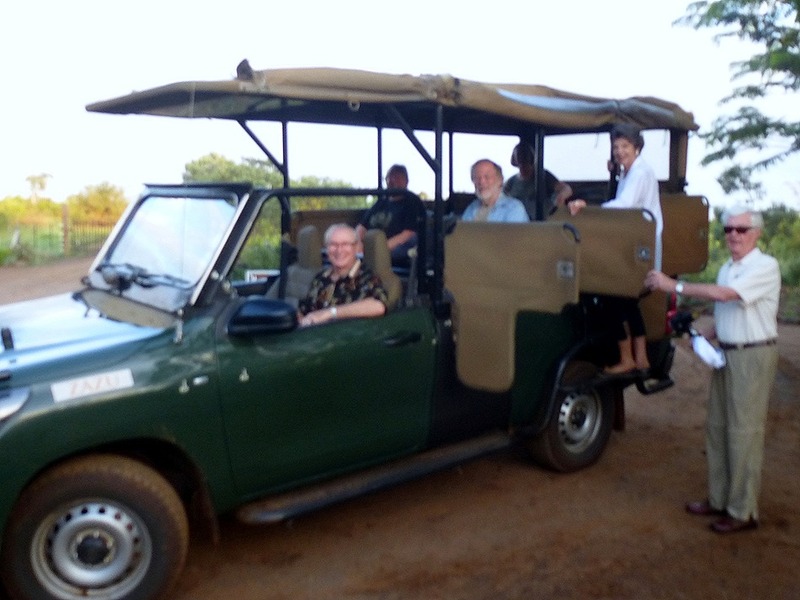 We all climbed into one of the game drive vehicles for the trip to Camp Shawu where the manager, Daniel, greeted us with refreshing drinks on the central lodge’s veranda. Our drive to Camp Shawu was through the Park, so of course we encountered more animals. In particular, our first zebras & another giraffe, with tiny crazed-looking Oxpecker birds riding onboard. We also encountered two male lions hiding behind a bush. We had actually gone by them when Mary called out “Lions!”, then our driver backed up so we could see them. One of them never bothered to look in our direction but his brother watched us apprehensively the whole time we were there. We were told that the animals see the vehicles as other animal, which they know are harmless from ample experience with them. We were told not to stand up because that might destroy the illusion and lead to trouble. Camp Shawu was named after an elephant who lived in this area for some 60 years and had the longest tusks ever measured in South Africa. It included a central building with a lounge area, a dining area and a veranda, and 5 individual sleeping huts, four of which were occupied by visitors when we were there. Raised wooden walkways connected all the buildings & an electrified fence surrounded the compound, so it was safe to walk between buildings even at night. The small size & excellent and friendly staff were great, but what really made Shawu special was its location on the edge of a lake created by a downstream dam. Game drives are scheduled in the morning, leaving before sunrise, and in late afternoon, returning after dark. The late morning and early afternoon represent free time (at least when you aren’t eating, which occurs frequently). Mostly we sat on the veranda of the main building watching the wildlife in and near the lake. The primary occupants of the lake were hippos, which were there pretty much all the time. They are nocturnal eaters, leaving the lake after dark to seek vegetation, and spend their days lolling around, sleeping or playing or fighting (its hard to tell what is playing and what is fighting). The hippos were quite loud; they sound a little like Jabba the Hut. During the day the lake shore was lined with many kinds of birds. On our first afternoon we noticed White-faced Ducks, Egyptian Geese, Yellow-billed Storks, and a Spotted Thick-Knee wading in the water. The lake also serves as a watering hole for a variety of animals. On our first afternoon we spotted impala, rhinos and an African Fish-Eagle on the other side of the lake. After yet another snack, in late afternoon we boarded the game drive vehicle and set out on our first actual game drive. 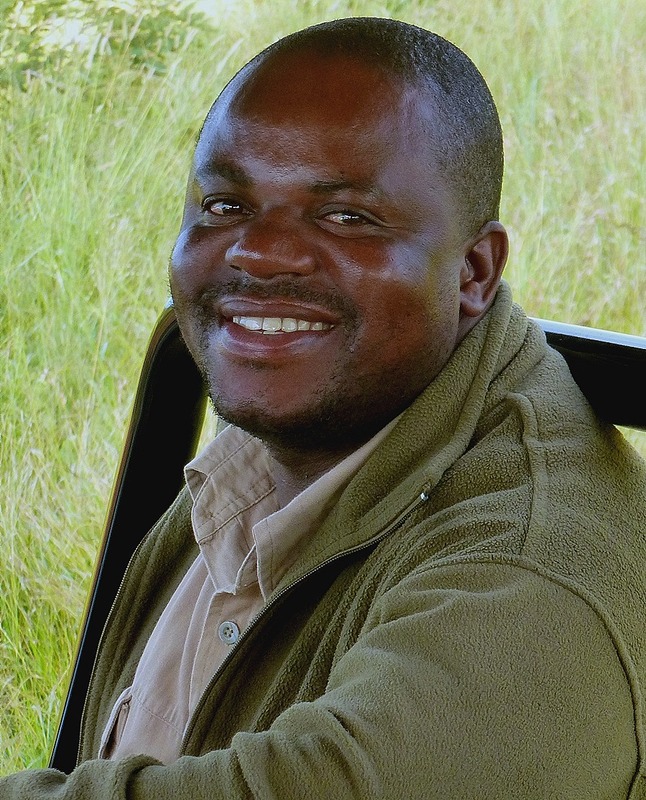 On some safaris I have read that each vehicle has a driver/guide and a tracker sitting at the front to spot game. Our driver, Safiso, was also our guide & tracker. He has extraordinary vision, time and again picking out animals and birds so hidden or distant that the rest of us had difficulty finding them even with binoculars. Our game drive vehicles were open on the sides with a roof, providing plenty of visible space along with protection from sun and rain. It seems that having a tracker sitting in front would often have cut into the view of the animals and landscapes we were there to see. The seats are tiered so that everyone sits higher than the person in front of them, giving everyone a good view. We rotated seats throughout the visit and, since there were only seven of us plus Safiso, everyone always had a window seat. A case in point was Safiso’s spotting of some baboons with a herd of impala very far away early in our evening game drive. They were so far away that none of us would have seen them at all without Safiso’s sharp eyes & experience. We saw some unusual birds: a striking Southern Yellow-billed Hornbill, a Swanson’s Spurfowl and a Lilac-breasted Roller (of which we would see many later). We had a long & close look at some White Rhinos. White birds called Cattle Egrets hang out with them & on their backs, eating insects. You will notice the long white lines on the rhinos’ face and back, which result from the birds on their backs doing what birds often do after eating! The rhinos don’t seem to mind (little fashion sense, I guess). We encountered a herd of wildebeest and one of impala. The impala are called “McDonald’s” by the folks in this area. This is partly because they are very numerous & often make a delicious snack for the carnivores. More specifically, though, when their tails are down their backsides look just like a McDonald’s golden arches sign! As dusk turned everything darker, Safiso spotted buzzards in a distant tree & a Red-backed Shrike. Darkness and distance made the pictures pretty blurry though. As the sun set each night we met the other safari vehicles carrying Amsterdam folks for a “sundowner,” which includes drinks & snacks. Always have to have something to eat! As we drove back toward Shawu in the dark Safiso used a hand-held spotlight to search for game. We didn’t see any game this time but we almost ran into a small owl standing in the middle of the road, possibly a Marsh Owl though it is hard to tell in the dark. Another bird in the road may have been a Dusky Lark. Above, the moon & clouds made for a dramatic sky. When we returned to the camp it was time for . . . guess what? Dinner! We were read the menu, could choose from two entrees, then ate too much. The food here was very good in addition to being plentiful. After dinner we retired to our room/ hut. From inside the hut the hippos sounded like they were right on our veranda. We actually looked to be sure & they were nowhere near us. Others had the same feeling in their rooms. Despite the loud hippos we had no trouble getting to sleep since it had been a long and eventful day. Good thing because our wake-up call was scheduled for 5:00 AM!